Born on New Year's Day, 1906, famed horse trainer Les Hilton had apprenticed under Will Rogers, and was hired by Twentieth Century-Fox to train both Flicka and her stunt double Goldie during the series. 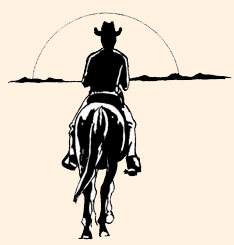 He lived on Saticoy Street in North Hollywood from at least the 1940s, where he had his house, stables, and a backyard office where he could keep an eye on his horses. Hilton's barn was a single shed row (one line of stalls with a wide covered aisle, all painted white, with his horse trailers in the yard in front of the barn. Behind the stalls were large corrals, and behind them the arena, which was about half an acre. The arena was where Les did most of his work. He also used the facilities of both the Fat Jones and the Hudkins Brothers movie stables (owned by brothers Ace, Art, Clyde and Ode Hudkins). Hilton was pretty much a life-long bachelor, married to his work and his animals, but he was apparently married one time, for a few months, although he seldom talked about it. His best friend was reportedly actor and World War II hero Audie Murphy, who was often seen at Les's place. Another good friend of his was a fellow named--of all things--Jesse James. 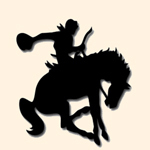 James owned a cattle ranch at the other end of the San Fernando Valley, and the three of them would often be seen together swapping jokes and stories. 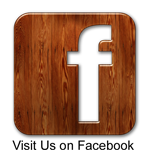 hand, used only to guide the animal." 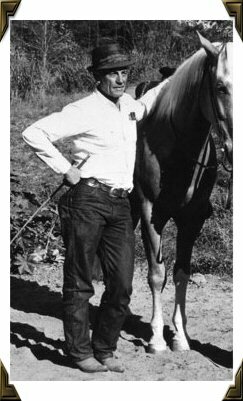 Hilton seldom did any riding instruction, but he spent a great deal of one-on-one time with Johnny Washbrook--riding alongside him day after day and meticulously teaching him how to handle Flicka. 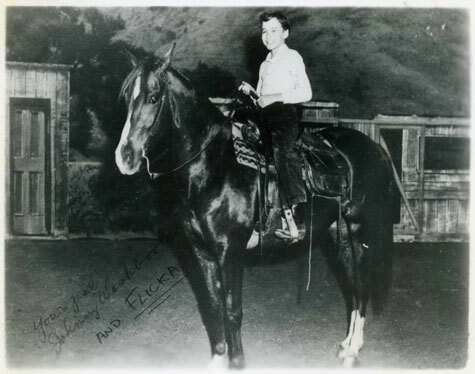 Johnny Washbrook says “Other than sitting on a pony at the age of three while someone walked us around in a little corral, I had no riding experience prior to the series—I was a real ‘city slicker’ from Toronto.” But under the expert guidance of Les Hilton, he became a very talented rider—especially on Flicka. 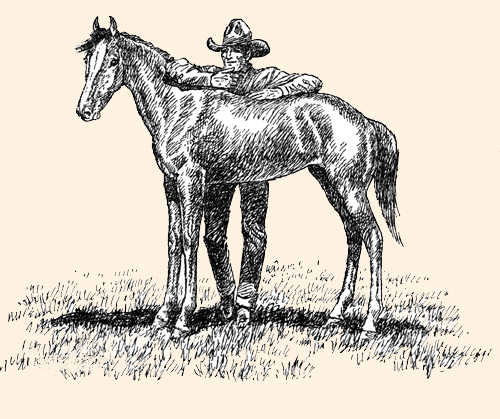 Hilton had formerly trained the mules in the Francis the Talking Mule series of motion pictures, and he was very experienced and well-respected as one of the elite of the horse-training world. 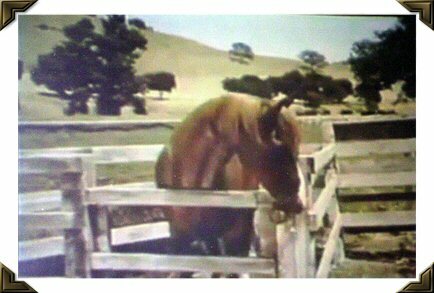 Hilton was also the trainer of Bamboo Harvester, the saddle-bred palomino stallion of the TV series Mr. Ed. 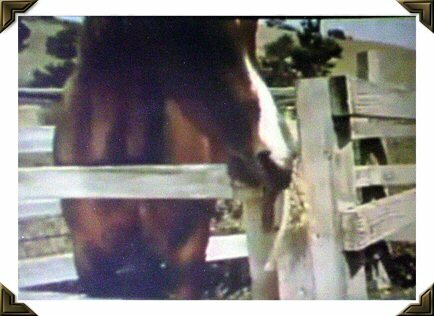 It is said that to get Mr. Ed to move his lips to coincide with the voice-overs, Hilton used nylon fishing line. The fishing line was attached to the headstall (which is why you never see Ed speaking without his headstall on) and ran through his mouth. When Mr. Ed was required to speak, Hilton gently pulled the line and Mr. Ed responded by moving his lips—a natural response to something moving in his mouth. Hilton also taught horses how to open and close doors, untie knots, wave a flag and hold items in their mouths for various scenes. Movie horse trainers use a lot of tricks and tools of the trade—many for their horses’ safety, like putting rubber cups on their hooves and non-stick tape on their teeth when scenes are filmed where the horses are supposed to be fighting. Those scenes are done slowly, and then the film is speeded up so that it looks like a vicious fight. Les Hilton trained a great many of the famous and not-so-famous horses that will all live forever in films. It amused him that the horses he trained carried a lot more insurance than he did. When Saticoy Street was rezoned for commercial use, Hilton sold his property and moved to Sparks Street in Burbank Rancho, north of Griffith Park. When he passed away in Burbank at age 70 on October 27, 1976 from pancreatic cancer, the entertainment industry lost one of filmdom's all-time greatest animal trainers and one of its great animal lovers.